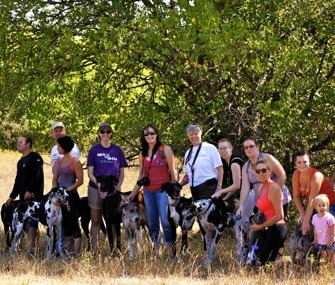 The Kansas City Area Great Dane Meetup is always a good time. When Jeffrey Reed of Kansas City, Kan., rescued his Great Dane,Cooper, he knew his new dog needed to socialize with other dogs, preferably some his own size. He wondered where he’d find a group of Dane-size pups to hang out with, but it turns out, it wasn’t too difficult. Reed was thrilled to learn about the Kansas City Area Great Dane Meetup, a local "Meetup" where more than 150 Great Dane owners get together to share their passion for their pooches' pedigree and let their dogs play with their canine pals. The Kansas City group is just one of nearly 50,000 Meetups worldwide. Meetup is an online platform that facilitates live events where people with similar interests can, well, meet up in their area. There are groups for nearly every kind of passion, from knitting to hiking to foreign language — and, of course, dogs. And with more than 700 dog-oriented Meetups in 414 cities and 17 countries, dog owners are certain to find a group near them. Many groups are centered on a specific breed. After registering at Meetup.com, anyone can create a group or join an existing Meetup. Organizers pay a $12 monthly fee to maintain the group’s page on the Meetup website, where members keep a schedule of events, post photos and participate in discussions. While the groups are managed online, there’s nothing virtual about the Meetup events themselves. Heather Lehrman, who owns the North Shore Gold Coast franchise of In Home Pet Services, started her own Meetup group on Long Island as a way to meet people in her area and give her Boston Terrier,Herbie, more opportunities to socialize with other dogs of a similar size. Lehrman’s Long Island Smushed Face Dog Meetup Group includes more than 90 Boston Terriers, French Bulldogs, Pugs, Pekingese, and Shih Tzus and their humans. The group gets together at a local park or other venue every four to six weeks. Lehrman says it’s helpful to have breed-specific Meetups because it’s easier when your group consists of dogs of similar sizes. “We take over the small-dog section of our park!” she says.